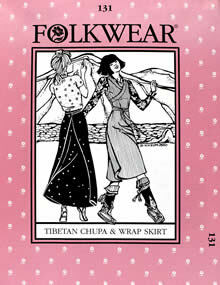 This wrapped jumper has a centuries-long history in Tibet. The Chupa features an asymmetrical wrap front, wide neckband, and simple faced armholes. Both the Chupa and Chupa-inspired skirt have unique side extensions that wrap around the back to tie in front. The resulting silhouette is slim, yet the wrapped extensions provide enough leg room to make walking easy. 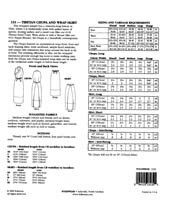 Pattern includes notes about the Chupa and how it is traditionally worn. Misses Extra Small to Extra Large.